Samsung yesterday unveiled its new Galaxy Note 8 in New York, introducing a device with a 6.3-inch AMOLED Infinity Display, 12-megapixel dual rear cameras, a new S Pen, a 10nm processor, 6GB RAM, IP68 water resistance, and a few features cribbed from Apple, including a "Live Focus" photo mode for adjusting depth and dual rear cameras with telephoto and wide-angle lenses. MacRumors videographer Matt Gonzalez attended Samsung's launch event and was able to get some hands-on time with the device this afternoon. 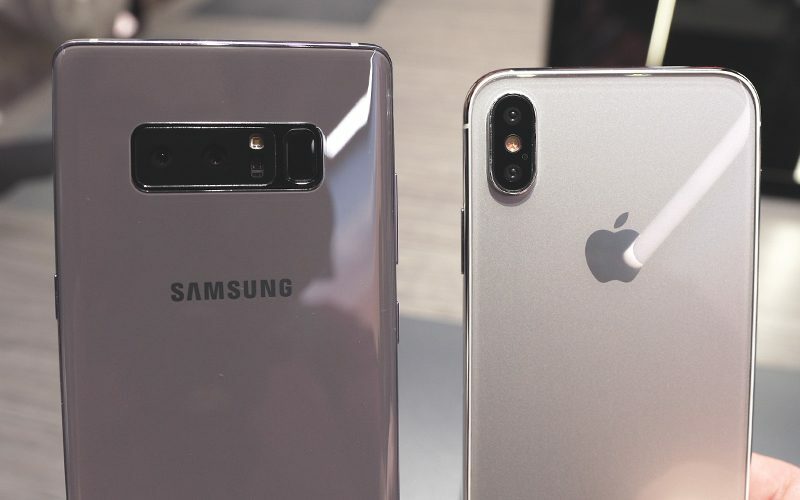 Because Samsung's Galaxy Note 8 will directly compete with Apple's upcoming "iPhone 8," we decided to compare Samsung's device with an iPhone 8 dummy to compare and contrast the design elements. Size wise, Samsung's Galaxy Note 8 is larger than the iPhone 8, with a 6.3-inch AMOLED display with a 18.5:9 aspect ratio. Comparatively, the iPhone 8 is expected to have a 5.8-inch OLED display. The Galaxy Note 8 has an Infinity display with no side bezels, but it does continue to have bezels at the top and the bottom. We're expecting the iPhone 8 to have a greater screen to body ratio, with slim bezels all around (so no infinity design) and no prominent top and bottom bezels aside from a notch that will house the front-facing camera and the sensors necessary to enable facial recognition. When it comes to colors, the Galaxy Note 8 is available in midnight black, orchid gray, deep sea blue, and maple gold. Apple, meanwhile, is rumored to be planning to release its 2017 iPhones in a black, silver, and a new shade of gold that's similar to a copper color. Like the iPhone 8, the Note 8 features a glass front and back with a metal band around the edges, with the glass enabling an inductive wireless charging feature. Inductive charging has long been available in Android devices, and is expected to make its first appearance in Apple's 2017 iPhone lineup. Neither the Note 8 nor the iPhone 8 have a physical home button, with the Note 8 instead sporting an on-screen home button that can detect pressure and offer haptic feedback to simulate a press. We're also expecting Apple to implement a similar virtual home button on the iPhone 8. Samsung's Note 8 features a fingerprint scanner on the back of the device, while the iPhone 8 may have no fingerprint scanning functionality at all. Samsung also augments its fingerprint technology with a facial and iris scanner, which we're also expecting in the iPhone 8, but rumors suggest Apple will have a better implementation that's far more secure. The Galaxy Note 8 is equipped with a top-of-the-line 10nm processor and 6GB RAM, while Apple's iPhone 8 is expected to feature an A11 chip (also built on a 10nm process) and somewhere in the range of 3GB RAM. The Galaxy line often outspecs the iPhone line on paper, but Apple's deep integration between hardware and software always causes the iPhone to outperform the Galaxy in the real world, and we expect that to be the case with the iPhone 8. Samsung's Galaxy Note 8 is already available for pre-order and will start shipping out on September 15, which is likely close to when Apple will unveil its own 2017 iPhone lineup. 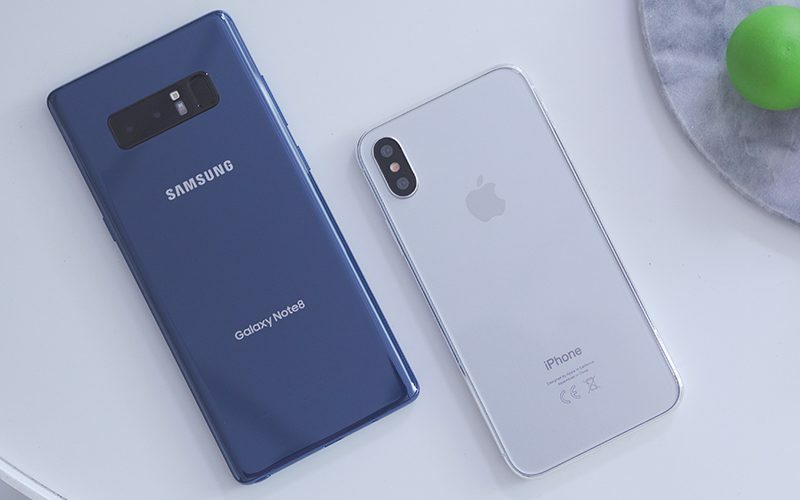 Samsung plans to sell the device for $930 to $960 depending on the carrier, a price point on par with the rumored price point of the high-end OLED iPhone, which could cost somewhere around $1,000. For a closer look at Apple's 2017 iPhone plans, make sure to check out our dedicated iPhone 8 roundup. Protruding camera is getting out of hand Apple, it's ugly as hell. The Note 8 is a great piece of hardware, but the iOS experience sells me over Android any day. The Hardware euphoria eventually wears off, it eventually comes down the software experience. ... Comparing a non-functional mock-up, that we don't even know if for sure is the finalized chassis design? It took Samsung 8 years to make the front of their phones attractive. Perhaps they'll need another 8 years to figure out the back. How can you talk about anyones back when the iphone will have that ugly vertical camera hump on the back and its ugly on every color. At least the note 8 has a black version that completely blends the back and its more gorgeous than any iphone 8 back.....furthermore the note 8 has a flushed camera...no one wants a buffalo hump. My god. The camera bump is just getting ridiculous at this point. Apple really needs to move on from that hideous thing. They will all look the same in 1 or 2 years. Software will be the only difference. Note 8 has a really ugly back. Funny to see so many complaints about the camera sticking out a bit. Seems we have some that care far far far more about what their phone looks like than how it functions. I bet these same people put a case on it that sticks out far further than the camera.